“Politics in Virginia starts on Labor Day in Buena Vista,” Warner said about a half-hour later, giving a brief speech in Glen Maury Park at the end of the Labor Day parade that has become in recent years the start of the fall politics season in Virginia, where every year is an election year, with federal offices up in even-numbered years and state elections in the off-years. Warner’s two opponents, Republican Ed Gillespie and Libertarian Robert Sarvis, were on hand, as was the chairman of the House Judiciary Committee, Bob Goodlatte, a Republican who represents Buena Vista in Congress, and former Democratic gubernatorial and attorney-general candidate Creigh Deeds, a state senator whose district also represents Buena Vista, a town nestled up against the Blue Ridge in Rockbridge County. Residents lined the streets from downtown to the park to shake hands and chat with the politicians, who were joined by their own phalanxes of foot soldiers carrying oversized campaign signs and chanting various slogans. 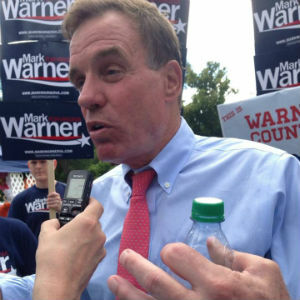 Warner made his first visit to the parade in 1993, three years before anyone would have heard of him, when he made an unsuccessful run for the U.S. Senate seat that he now holds, and was held then by popular Republican incumbent John Warner. He’s been in Buena Vista campaigning for himself, as he did in ’96, 2001, the year he was elected governor, and in 2008, when he was elected to the U.S. Senate; and for others, most notably in 2006, when he stood in for Democrat Jim Webb, who was on the verge of a historic upset of Republican Sen. George Allen, and Webb was distracted from politicking by the impending departure of his son about to be deployed to Iraq. A Northern Virginia tech multimillionaire, Warner is at ease in otherwise red Republican rural Virginia more than any other Virginia Democrat, even the hometown Deeds. He won the bright red Sixth District in 2008 with 58 percent of the vote in his two-way race with former Republican governor Jim Gilmore, for example. His ability to identify with rural voters comes from his own background, as the first member of his family to graduate from college, and his own bootstraps entrepreneurial efforts that led to his success in business and later in politics. “One of the things that brought me to politics was that in the 21st century, you shouldn’t have to move away from your hometown to find a world-class job. We’ve got more challenges to doing that, but we’ve got to make sure rural Virginia is not left behind in this 21st century,” Warner told those assembled at Glen Maury Park. By the time he was speaking on the dais, he was in a fresh set of clothes. He’d sweated through his light blue dress shirt on his walk through the streets of Buena Vista, to the point that one man on a lawn chair asked him as they shook hands if Warner had dumped himself in an ALS ice bucket challenge before the parade. “No, but today is my Buena Vista Challenge,” Warner replied without missing a beat. The race is hardly that; Warner was up 25 points in the most recent public poll on the re-election contest from July, but the sweat stains on his first shirt of the day would seem to suggest that the senator is taking this one easily. Warner himself is frustrated by the gridlock and division in Washington. He ran in 2008 talking about his success in Richmond in reaching across the aisle to work with a Republican state legislature to get things done, but he’s learned since that what works in Richmond doesn’t work in Washington, and that not much really seems to work in Washington these days. Warner spoke first at the park. He was followed by Goodlatte and Gillespie, an advisor to former President George W. Bush and a former Republican National Committee chairman, neither of whom betrayed even a slight interest in ceding an inch of ground in terms of compromise to anything vaguely Democratic in nature. “America deserves better. There are a growing number of us in both parties who realize that. We just have to make it safe that you can work together,” he said. That one was met with polite applause from a handful of Democrats in attendance, and silence from the Republicans.